The Dreambaby Chelsea Auto-Close Metal Security Gate combines safety and convenience in one fantastic package. Great for every home, this pressure-mounted gate is easy to install and is perfect for temporary or rental properties with no screws or drilling required. Designed by parents, for parents, the Chelsea gate is easy to install, allows for one-handed operation, a door that opens in both directions and closes automatically from any distance, every time. For added security, the EZY-Check indicator shows the gate is securely locked with just a quick glance and the double action locking feature helps keep even the most curious toddlers at bay. Smart Stay-Open feature is perfect for when you need to move freely through the gate, such as when you're carrying groceries or clearing the table. Just swing the door in the stay-open position and it will stay wide open until you choose to close it. VERSATILE AND DEPENDABLE: 2 x 3.5 inch extensions included, it can accommodate openings of 28 inch - 39 inch wide, 29.5 inch tall. Using additional extensions sold separately, the gate can be extended up to 188 inch. QUICK AND EASY OPERATION: Installation is a breeze and using it is even easier. Allows for one-handed operation and the double action locking feature helps keep even the most curious toddlers at bay. SMART STAY-OPEN: Doing laundry, entertaining guests, making dinner? With the convenience of Smart Stay-Open, the Chelsea gate can be made to stay open whenever you choose. AUTO-CLOSE TECHNOLOGY: Convenience of Auto-Close, which ensures constant and reliable safety of a gate that closes automatically from any distance, every time. EZY-CHECK INDICATOR: The EZY-Check indicator will help you identify your gate is securely locked with just a quick glance. Tip: It also helps indicate your gate is properly installed. GREAT FOR PETS TOO! : Made of strong, high-quality materials it's perfect for large and even the most eager pets too! The Dreambaby Newport Adapta-Gate combines safety and convenience in one fantastic package. Hardware mounted for stability, it incorporates three hinged panels that can accommodate straight, angled, wide, and/or irregular openings and landings. Unlike many other gates that only span a doorway, it creates safe and roomy landings at the top or bottom of staircases and can also be used across wider openings. It's easy to arrange and install. Our gate allows for one-handed operation, has a convenient automatic close-and-lock feature, and comes with an EZY-Check indicator so you know when the gate is securely closed. Stay-Open feature, which is perfect for when you need to move freely through. The Dreambaby Newport Adapta Gate swings open in both directions, but you can limit it to open in only one direction. This feature is especially important when used at the top of stairs. Hinged panels can accommodate openings of 33.5 inch - 79 inch across. Gate measures 29 inch high. The Everbilt Gate Kit includes T-Hinges which are designed for applications with narrow frame or post, such as barn doors, shed doors, and gates. The gate latch offers simple security for inward- and outward-swinging gates and doors. Features a self-latching fingertip release. 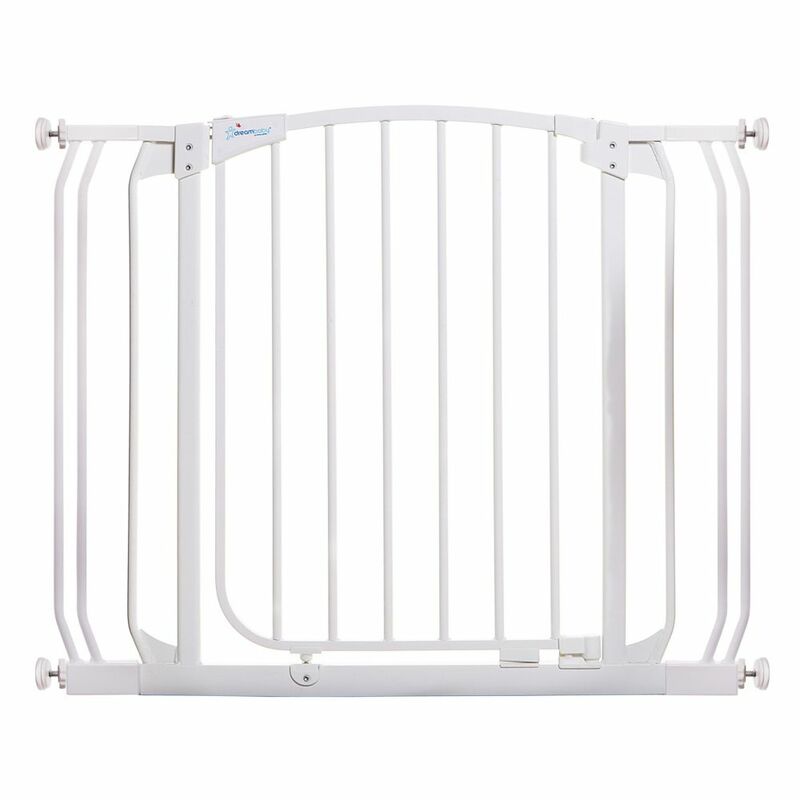 The Chelsea Auto-Close Security Gate - White The Dreambaby Chelsea Auto-Close Metal Security Gate combines safety and convenience in one fantastic package. Great for every home, this pressure-mounted gate is easy to install and is perfect for temporary or rental properties with no screws or drilling required. Designed by parents, for parents, the Chelsea gate is easy to install, allows for one-handed operation, a door that opens in both directions and closes automatically from any distance, every time. For added security, the EZY-Check indicator shows the gate is securely locked with just a quick glance and the double action locking feature helps keep even the most curious toddlers at bay. Smart Stay-Open feature is perfect for when you need to move freely through the gate, such as when you're carrying groceries or clearing the table. Just swing the door in the stay-open position and it will stay wide open until you choose to close it. The Chelsea Auto-Close Security Gate - White is rated 4.6 out of 5 by 97. Rated 5 out of 5 by Foghat from Very well designed. Sturdy. Looks great installed. ... Very well designed. Sturdy. Looks great installed. Good instructions and photos. Works very well. Rated 5 out of 5 by Grams from Great baby gate Easy to put together, easy to use. We needed a gate that would span a wide hallway (56"), this gate system works well and I would highly recommend it. Rated 5 out of 5 by mreedlifts from Great walk through wide pet gate Fits my 65.5 entryway perfectly! Rated 5 out of 5 by Canine Fan from Simply The Best Ok, so we use our Dreambaby gates as dog gates. The quality is superior to every other one we've tried and installation is a breeze. I do wish the safety labels were easier to get off, as they are a distraction, but it did not stop a second purchase. Rated 5 out of 5 by L from Great gate for French doors Used this gate with extenders to block French doors to a second level patio. They fit and work great! Rated 5 out of 5 by Lexi from Great quality product. Thank you Danielle for your recommendations on this baby gate and extensions for the doorway size that we needed and for your help with other questions that we had.